On 24 November, the Hyatt Hotel was the venue for a conflab on the question of whether Birmingham should have an elected mayor, featuring speakers from the Yes and No campaigns, and an audience of “about 80“. In the discussion, Councillor John Hemming, from the No campaign, said there was a ‘minor debate’ about whether a mayor should have more powers, and the ‘big debate’ was about whether or not to change to an elected mayoralty. But in reality, the topic of what an elected mayor is ‘for’ – and the reach of the mayoral executive – are fundamental. One might reasonably expect an elected mayor to have final responsibility for economic planning, built environment, and transport, in the mayoral ‘area’ – whatever that might be. In which case, there would need to be substantial changes to current governance arrangements across a range of agencies. For example, transport in the West Midlands county is currently the responsibility of Centro, with decisions made – at least on paper – by a committee system of councillors from seven metropolitan boroughs (though in practice, policy is largely made by the local government officers). At the time of writing, the mock-up of the Yes to Birmingham mayor campaign website, at www.weonlydoawesome.com, shows Centro as a supporter, presumably because head of strategy Alex Burrows is a leader of the Yes campaign. But it seems bizarre that Centro would publicly or privately back a campaign that calls into question its continued governance (or existence). Californians suffering from a massive case of “sticker shock” over the new $99 billion price tag for the state’s bullet train project got some more unsettling details Tuesday: The high-speed trains will attract fewer riders and less revenue than originally promised. And more than half of the money needed to build the rail line would come from federal funding that currently doesn’t exist. The bullet train is now expected to cost nearly triple what voters were promised when they approved the plan in 2008 and more than double the 2009 estimate. Most high-speed rail systems around the world require a public subsidy, but California voters have forbidden the Golden State’s bullet train from using tax funds for operations. In the HS2 Ltd estimates, just over £1 billion is allowed for what is, in effect, a total rebuild of Euston station, and the Y network is supposed to reach *city centre* Leeds and Manchester, for an outlay of only £32.3 billion. These figures aren’t plausible. Notwithstanding the optimism bias allowance in the project, it’s inevitable that sooner or later, HS2 going to provide its own California-style sticker shock. One of the first actions of the newly-formed West Midlands Passenger Transport Executive (now known as Centro) was to close down the Walsall trolleybus system. Following its closure on 3 October 1970, road passenger transport in the West Midlands became entirely dependent on the diesel engine, and today, diesel buses are a major contributor to the West Midlands county’s bad air quality. Centro’s 2009-2014 Environmental Strategy has little to say about pollution from public transport, and any reduction in pollution from buses has occurred through European emissions regulations for new vehicles, rather than from action on the part of local authorities. Although the conventional bus fleet is becoming cleaner as a result of newer vehicles replacing older ones, there needs to be more use of alternatives to diesel buses. On the most important corridors, there would be the possibility of (re-)introducing trolleybuses. Traditional battery buses have been range and performance limited, while trolleybuses have been limited to on-wire operation, unless equipped with an auxiliary power source (generally a small diesel engine). But improvements in battery and capacitor technology mean that all-electric trolleybuses, with off-wire capability, should now be possible. Centro’s hurriedly developed Sprint ‘bus rapid transit’ is planned to use buses styled to look like trams. But so far as can be ascertained, behind the plastic wheel covers, they would be standard ‘low emission’ diesel buses. On the other hand, trolleybuses on the principal corridors could make cost-effective use of overhead infrastructure (unlike the overhead on the Midland Metro tramway, which is at best only used by one service running every 6-7 minutes). 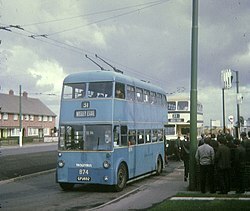 In Birmingham, potential corridors for trolleybus operation include the Alcester Road, Soho Road, Walsall Road, Hagley Road, Bordesley Green, and Coventry Road. Britain’s economic geography is not well suited to the Adonis/Steer pattern of high speed rail, currently being pursued by the coalition government. A better way forward would be to develop and extend the existing network, with more clockface timetabling, and high quality interchange. In Greater Manchester, this approach could be used to provide fast direct rail connections to places outside of the conurbation centre. One might imagine a scenario where infrastructure works, such as the Ordsall curve and further Transpennine electrification, allowed intercity trains from London Euston to Manchester to continue to Bolton, Rochdale, and possibly other destinations. Reducing the local leg components of journeys in this way enables ‘classic rail’ to compete against high speed rail on journey time. In the HS2 Y-network, access to the intercity leg of a journey would happen in a currently unknown location in Manchester. With the Rail Package 6 approach, there are more intercity access points, closer to the traveller’s point of origin (e.g., Bolton, Stockport, etc). The same considerations apply in other areas. For example, in the Rail Package 6 approach, West Bromwich is directly connected to London by Chiltern intercity rail. In the model put forward by Centro, the local transport authority, the same journey would involve an excruciatingly slow Midland Metro tram from West Bromwich to Stephenson Street, followed by a walk to Curzon Street HS2 station, followed by a HS2 journey to Euston. Having examined HS2‘s unusable capacity, lumpy blobs, and spacing requirements, it might be worth taking another look at capacity realities, as they apply to train lengths. HS2 Ltd’s plan is for services to be provided by trains formed by 200-metre long distributed traction trainsets, worked singly or as 400-metre coupled pairs. In its documentation, the company referred to a 200-metre long ‘550 seat’ Reference train, which was later revealed to be the Alstom AGV11. However, at Innotrans 2008, Alstom stated that the AGV11 had seating for “420 to 460 passengers”. Alstom’s older TGV-Réseau, used on SNCF domestic and cross-border Thalys service, is a 200-metre trainset with end-power-cars, and a capacity of 377, or 361 after refurbishment. The China Railways CRH3C is a 200-metre long version of the distributed-traction Siemens Velaro, with seating for 548 in three classes of accommodation. However, the CRH3C body is wider than (European) standard Velaros, to enable a 3-plus-2 seating arrangement. So on the information available, it seems quite unlikely that a 200-metre HS2 train would be able to seat 550 passengers, unless the second class vehicles had ‘cattle truck’ seating. 200-metre classic compatible HS2 units would have less room than 11-car Pendolinos, and that would certainly be felt on North West England and Scottish services. As can be seen from the paths diagram, Chiltern is a very long way from being ‘intensively operated’, and there should be no problem in transferring all London – West Midlands intercity services to it. The operator, Chiltern Railways, currently uses short trains that serve London Marylebone and Birmingham Moor Street. For a very high capacity London to Birmingham intercity service, platforming requirements would probably require use of stations at Old Oak Common, and Birmingham Snow Hill. By contrast, the foolhardy HS2 idea of channelling all fast services from the North of England along one track to Euston would present a maintenance and resilience nightmare. It makes a lot more sense to spread fast intercity traffic over a number of lines, and provide network-capable rolling stock that can be switched between them (the ‘Rail Package 6‘ concept). Andrew Round, head of development at Birmingham city council, has claimed that a planned 1,000-space underground car park in Eastside is needed to meet demand from new businesses and Birmingham City University. The idea is under consideration as part of a fresh look at the council’s Eastside Masterplan. Mr Round said a combination of students, employees in businesses moving into the area and the high speed rail station meant that Eastside would require at least 3,000 parking spaces over the next few years to cope with demand. It’s probable that a lot more car parking, below and above ground, would spring up around Curzon Street, if HS2 were built. Using the airspace above a future Curzon Street HS2 station would be a continuation of what already happens at New Street and Snow Hill stations. Even Moor Street station hosted car parking, until the rebuilding of the St Martin’s area swept its goods yard away.